The DRDC becomes a WFTDA apprentice league! The Dark River Derby coalition is now a WFTDA (Women’s Flat Track Derby Association) apprentice league! For more information visit: wftda.com. Final Bout of the Season – October 26th! Let’s do the Time Warp … one last time! The Dark River Derby Coalition will take on the So ILL Roller Girls for the LAST home bout of the 2014 season. Don’t forget your costume and dancing shoes for a halftime costume contest and Time Warp dance off! I Want You for Roller Derby! The Dark River Derby Coalition is holding its 2014 Recruitment Extravaganza! You may attend 1 or both of these dates at Scotties fun spot – Quincy 8000 Broadway Quincy! If you want to skate, ref, volunteer, or coach, this is your time to come out and become involved in Quincy’s first women’s flat track roller derby league. No experience is necessary! If you have the willingness to train, we would love to have you. 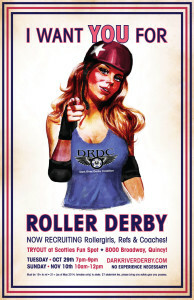 SKATERS- THIS IS YOUR ONLY CHANCE TO JOIN THE DRDC FOR THE ENTIRE YEAR!! Can’t make tryouts? Message us here or email info@darkriverderby.com prior to these dates to work something out. Want to see what derby is all about before you try out? Come to our last bout on Saturday, October 26th and stay after/come to our after party at State Street Bar and Grill and talk to the current DRDC members. September 14, ZOMBIES VS. UNICORNS! The Epic battle you’ve been waiting for: ZOMBIES VS. UNICORNS! The Dark River Derby Coalition will take on the Crash Test Dolls in terrifyingly magical battle royal!! Break out the pocket protector… “Queen of the Nerds” June 1st! The Dark River Derby Coalition will take on the McLean County Missfits on June 1! Break out the pocket protector for this bout which will benefit the Advocacy Network for Children.